Argentina is one of the giants among national football teams and the population is known for its immense football passion; Jonathan Wilson writes in Angels with Dirty Faces: “No country so intellectualizes its soccer, so loves its theories and its myths”. When talking of Argentina in context of football it impossible to leapfrog Diego Maradona and Lionel Messi, two of the greatest football players of all time. But the history goes further back and in earlier periods other stars has redeemed Argentine football such as Manuel Seoane, Antonio Sastre, Adolfo Pedernera and Omar Sívori. The team is also known as the Albiceleste, from the colors of the shirt. 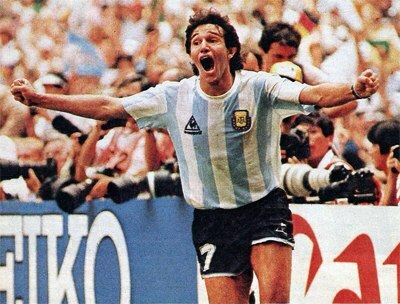 Jorge Burruchaga celebrating Argentine triumph in 1986 World Cup final. Argentina would win its first Campeonato Sudamericano title in 1921 and three more victories would follow in the same decade. It was obvious at the time that Argentina could compete with the best teams in Europe; during a tour on the continent in 1925, Argentina won 16 out of 19 games. Before the establishment of the World Cup, the Olympic Games yielded as the most prestigious international tournament. 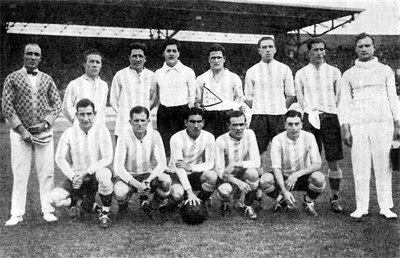 Argentina participated in the tournament for the first time in 1928. The team run through the tournament in superior style, winning by a combined score of 23-5 before facing the big rival Uruguay in the final. The game finished 1-1, which led to a rematch three days later, which was won by Uruguay 2 to 1. Argentina team of the 1928 Olympic games. In the first World Cup, played in Uruguay, Argentina would be one of the 13 participating teams. They won their group ahead of Chile, France and Mexico and after destroying USA by 6-1 in the semi-finals they would once again meet Uruguay in an immortal final. This was probably the biggest game so far in Argentine football and over 10,000 Argentine supporters went to Montevideo to see the match at the Estadio Centenario. Uruguay would take the lead, but two goals from Carlos Peucelle and Guillermo Stábile would put Argentina ahead. Nevertheless, the outcome would once again be Argentine frustration. Uruguay would lose its dominance in the game, but the role as the super power in football wouldn’t be taken by Argentina. Between the years 1934 and 1962 the national team would either produce rather weak performances or not participate at all in the World Cup. This was much to the fact that Argentina didn’t use professional players in the national team until 1962. The squad that participated in the second World Cup, held in Italy, was especially weak and it was eliminated from the tournament in the first game after a loss to Sweden. After 1934, Argentina would withdraw from all World Cup tournaments (partly because of a dispute with FIFA, partly because of political protectionism) until 1958. The team of 1958 was South American champions, but unfortunately, it would be hashed by Italian purchasers who attracted players as Omar Sivori, Angelillo and Juan Maschio over to Europe. Above that, the River Plates’ Roberto Zárate was injured. Argentina had dominated South American football for a long time, but the team that represented the country in 1958 World Cup would return home from Sweden after a fiasco – they finished fourth and last in their group including a 1-6 humiliation against Czechoslovakia in the third match. Yet, great performances in the Campeonato Sudamericano (South American Championships) continued. After losing another final to Uruguay in 1935, the Albiceleste would win the Campeonato Sudamericano after a playoff against Brazil. In the 1940s, Argentina won four of the six editions of the Campeonato Sudamericano (in 1949, AFA didn’t send a team), and they would continue to be one of the best performing sides on the continent the following decade. One of the best tournament performances by an Argentine national side came in the 1957 Campeonato Sudamericano. They went undefeated through the tournament until they lose in the last game – against the rest of the continent (i.e. Brazil, Colombia, Chile, Ecuador, Peru and Uruguay) they achieved a combined score of 26-6. After the 1958 meltdown in Sweden a new coaching staff and with Victorio Spinetto as head coach were installed, and almost an entirely new player squad was constructed. 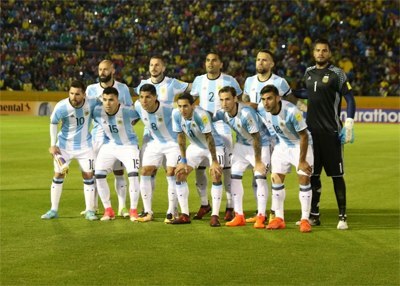 Once again, Argentina performed at top when they played in on home soil in Campeonato Sudamericano – they finished first, one point ahead of Brazil. Although blamed by some for adopting anti-fútbol, Victorio Spinetto, gave the team a new tactical direction. When Argentina played the next world cup, Spinneto, had however, already been replaced by Juan Carlos Lorenzo, also him associated with pragmatic and defensive play. Jonathan Wilson writes in Angels with Dirty Faces that “in the 1960s Argentinian soccer became tougher and more cynical, the outlook more defensive”, and here also referring to the national club football. Argentina did qualify to the 1962 World Cup in Chile. It would be a triumph for one South American side, but not Argentina. Brazil would win the tournament whereas Argentina failed to progress from the group with a very small margin to England. For years later, Argentina did qualify together with three other Comnebol members to participate in 1966 World Cup in England. The preparations had been disturbed by the military coup that happened just a month before the final tournament and by the fact that a new coach, Juan Carlos Lorenzo, suddenly had been appointed just weeks before the first match in England. The players didn’t get along with Lorenzo concerning the playing system which was further damaging. Also, the players were surprised by discovering that the ball to be used in the tournament was not the same as the model they had been used in the training. Argentina would reach the knockout stage, but once again England would be the reason for elimination. The Argentine team, playing at Wembley Stadium in front of over 90,000 didn’t manage to score and England would win the match, after a late goal by Geoff Hurst, and later the whole tournament. Things got from worse to worse. Juan Carlos Lorenzo left his post shortly after the World Cup in England and a period followed with many coaches lasting only short periods. The results on the field were weak and for the first time Argentina did not qualify for a World Cup. Adolfo Pedernera, one of the best Argentine players through history, did surely not last long at the job as head coach after that low point. Juan José Pizzuti, Omar Sívori and Vladislao Cap would follow as engaged in the same position. Argentina qualified for the 1974 World Cup in Germany. After some half-convincing games, they would advance to the second round in the tournament together with Poland from Group 4. By this edition of the World Cup, the format had changed and a second group phase preceded the knockout stage. Argentina didn’t succeed to win any game in their group with the Netherlands, Brazil and East Germany. The Campeonato Sudamericano had come to a halt after 1967, but was renewed in 1975 and rebranded to Copa América. The first edition of Copa América didn’t become a new success to Argentina that had been drawn in the same group as Brazil. Both Brazil and Argentina won comfortable against Venezuela (in one of the matches Argentina won 11-0, which is their second biggest win ever – the biggest was 12-0 against Ecuador in 1942), but Brazil would win 2-1 and 1-0 in the matches versus Argentina. In the following year the president Isabel Perón was removed from the power and general Jorge Rafael Videla took over as a result of a military coup. The political situation in Argentine had been unstable even before the coup in 1976 – in 1930 came the first military coup and many governments up to 1976 had been established with the military involved in one way or another. But the 1976 coup have remained the most notorious in Argentine history and it was the beginning of a dark period in the country. Approximately 30,000 people that didn’t support the regime was “disappeared” during this period. 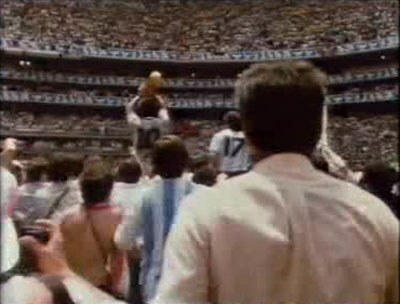 Bad timing had ensured that Argentine stood as host for the 1978 World Cup. The construction and restoration of stadiums was far behind schedule, but the process did by time accelerate and was ready when the tournament was about to start. That didn’t stop the World Cup in Argentina from being a most controversial one and the players of the home national squad faced a moral dilemma. Nevertheless, it would turn out to be the greatest success so far for the Argentine football national team. Vladislao Cap had lost his job as head coach for the national team after the 1974 World Cup and Luis Menotti took over. Menotti would remain at the post for eight years and became one of the most remembered AFA coaches. His philosophy of football would set marks on Argentinian football for a long time and he would also be the first to lead the team to a world champion title. One of the first things Menotti did was to change the preparation routines for a bigger tournament. He made the national team a bigger priority and expanded the period of preparations. More players were tried before a squad were decided for a World Cup than had been the case before. One of the candidates for the Argentina XI at that time was the 17-years old Diego Maradona, who has made his debut in 1977. In the end, Maradona was left outside the 1978 World Cup squad, but the young prodigy would instead be the star in the Argentina U20 that won the 1979 FIFA World Youth Championship. The squad Menotti had put together for the 1978 World Cup tournament consisted exclusively of players based in South America except the Valencia player Mario Kempes. The much-awaited tournament took off and it looked great for Argentina after two victories against Hungary and France. Italy waited in the last group match and now the drawback came, AFA were defeated with 1-0. Nevertheless, Argentina advanced to the second round and were placed in the same group as Brazil, Peru and Poland. The key match against Brazil was a draw and that made it a race for the best goal difference. Brazil had a 5+ goal difference after three played games and Argentina had only 2+ before their last match against Peru. They needed to win by at least three goals. The match on the 21 June at Estadio Gigante de Arroyito has become one of the controversial matches in the history of World Cup. When the referee blew the final whistle, Argentine had won 6-0 and would play the final whereas Brazil would be playing for the third place. Some has speculated that the match against Peru was fixed, but no proof of any kind has ever been accounted for. In the end, white confetti would rain over the Estadio Monumental field in Buenos Aires when Argentina led by Mario Kempes overcome the Netherlands in a dramatic final. 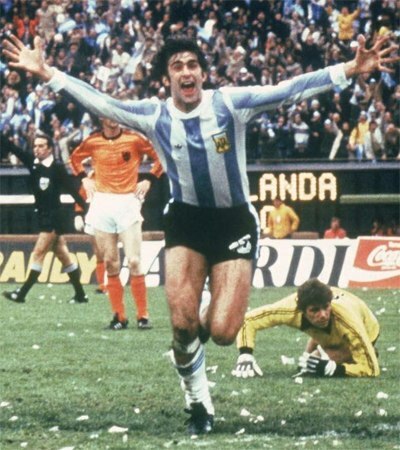 Kempes scores in the 1978 final. The 1982 World Cup coincided with the Falklands War. The Argentine press did their best to imply that Argentine was the stronger part; the players of the Argentina got therefore chocking news after their arrival to Europe and reading Spanish newspaper commentating the war from an objective angle – Argentine was clearly losing in the conflict. Directly from the first match it stood clear that the 1982 version of the Argentina team couldn’t match the champion standard of 1978, although Maradona was in the squad. They lost their first match against Belgium but rebounded with victories in the two following group matches. In the second round Argentina ended up together with Italy and Brazil and did lose both their games. Italy that defeated the Albiceleste with 2-1 would go on and win the trophy. Shortly after the 1982 World Cup, Menotti resigned and Carlos Bilardo who had been successful with Estudiantes was chosen as the new national team coach. Carlos Bilardo may have been remembered as a truly successful coach, taking Argentina to two world cup finals. But this was an era in which the average result seen over all competition matches was the worst ever for the team. In the 1980s, Argentina came as best on the third place in the Copa América. But what is best remembered is of course the golden 1996 World Cup event in Mexico. The victory has often been referred to one man, but things are, of course, little more multifaceted in football. On the tactical side, Argentina had an ace up the sleeve – a 3-5-2 formation that was first tested by Bilardo in 1984. Many stars were anticipated to give outstanding performance in Mexico that summer, such as Enzo Francescoli, Michel Platini, Karl-Heinz Rummenigge and Hugo Sánchez. But one player would over-shadow the rest, Diego Maradona who did 5 goals and 5 assists (Argentina did 14 goals in the tournament). An important aspect concerning Maradona’s superior role was that the referees didn’t allow the same rough treatment that had hindered and frustrated the football genius in 1982. Also, he had a been built around him, which gave him a natural leading role. Argentina had no problems to progress from their group after two victories and one draw. Maradona had performed on an impressive level, but he would take his game even higher in the following matches against Uruguay, England and Belgium. In the final, his contribution was not that evident; West Germany did a great job to neutralize his impact, but they couldn’t stop him from deliver the perfect pass to Burruchaga that set him free against the goalkeeper Harald Schumacher to score the deciding 3-2 goal. Argentina celebrates their 1986 triumph. The results that followed after 1986 was, however, bleak for the world champion team. In 1987, as the hosts for Copa América, AFA was eliminated in the semi-finals after 0-1 against Uruguay and when lost the third-place match against Colombia. Claudio Caniggia was in the 1987 Copa América team and he would replace Valdano as the forward partner to Maradona in the following world cup. The 1990 World Cup that took place in Italy would almost be another Argentine success. Apart from the result, however, the performance from the team couldn’t match that in the previous tournament (the performance from their biggest star, Maradona, was impacted by a toe injury). Argentina had to struggle all the way, after a chocking loss against Cameron in the opening game. In the same game, the goalkeeper Nery Pumpido broke his leg and was replaced by Sergio Goycochea. Sergio Goycochea who was an expert on penalty savings would become a key figure since Argentina was involved in two penalty shootouts. After defeating Brazil in the Round 16, in which Maradona made his most memorable piece, by driving the ball from the middle of the field and when surrendered by Brazilian players set up Caniggia to score, Argentina didn’t win anymore matches during the ordinary match time. After 0-0 and 1-1 they eliminated Yugoslavia and Italy after penalty shootouts. Albeit only been number three in the group, being pressed by Brazil in the Round of 16 and winning only after penalty-shootouts, Argentina was in another World Cup final. But the odds were not the best. Besides from not performing on a champion level, Cannigia had received his second yellow card in the semi-final and wasn’t allowed to play in the final. The spectators of the final would see the Argentine players delivering anti-football. Symptomatically, a penalty in the last ten minutes would settle the outcome in favor the West Germany. It would take 24 years until Argentina made it to the final in another World Cup and that game would also take end bad after one German goal. During the following years, Maradona’s life was busy, affected by affairs outside the football field and it was a surprise to many that he finally ended in up in the 1994 World Cup squad (Maradona had rejoined the team for the Playoff match against Australia). But sadly, the World Cup story would soon end abruptly. Although a fine performance on the field, Maradona would not remain in the tournament after testing positive for ephedrine. Maradona would be replaced by Ariel Ortega, which was an exciting player whose style resemblance the former number 10. Argentina was nevertheless eliminated by a terrific playing Romania in the Round of 16. New generations of players would take on and among the most prominent would be names such as Gabriel Batistuta, Diego Simeone, Javier Zanetti and Juan Sebastián Verón. Daniel Passarella had taken over as coach and introduced a strict discipline: long hair, earrings, and even homosexuality(!) was banned. Batistuta was separated from the team during a long period until he finally made a haircut; Fernando Redondo that refused a concession remained outside the team. In the World Cup that followed, Argentina would eliminate England after a thriller, but lose a tight semi-final against the Netherlands. In 2002 Argentina – now with Marcelo Bielsa as coach, once again faced England, this time in the group and went down 1-2. That meant they had to win against Sweden in the last match (or England had to lose to Nigeria), but despite a huge playing advantage the match ended 1-1. Argentina was out already in the first round, it hadn’t happened since 1962. The Argentine side that arrived to the following World Cup was stuffed with star players such as Javier Mascherano, Esteban Cambiasso and Juan Román Riquelme. As one of the favorites they become even more bestowed after a 6-0 demolition of Serbia and Montenegro, which also included a display of magnificent football. In the same match Lionel Messi made his World Cup debut and contributed with one assist and one goal. The match against Mexico in the round of 16 was more even than expected, but in the end Maxi Rodríguez would make it 2-1 on extra time with a beautiful long-range shot. Sadly, for the fans of Argentina, the national team were to be eliminated after a penalty shootout by the host team Germany in the quarter-finals. The coach José Pékerman would be criticized for not letting Messi play a single minute in the last game. Alfio Basile took over the job. Although he did only last two years until it was time for yet another chapter of Diego Maradona in Argentine football. On October 2008 he was appointed as the new coach and would stay during the following World Cup tournament qualification and finals. The hopes for a third Argentine World Cup glory was when set with Maradona as coach and his inheritor on the pitch. Messi would however not be the savior that so many hoped for. Once again, Argentina would be overcome in a World Cup by Germany, this time in a humiliated fashion. Germany beat Argentina with 4-0 in Cape Town and for the fans of the Albiceleste it lay four years of waiting in front of them. In 2014, on South American soil, it was once again a World Cup that was anticipated by many to be “Messi’s tournament”. And at least, it would – almost – be Argentine’s. Brazil, perhaps the biggest favorite after all, were completely crushed in the semi-final. Argentina who had reach the final was not happy by the name of the opponents. According to the statistics Argentina hadn’t beat Germany (or West Germany) in a World Cup since 1986. Argentina played defensive in the final, perhaps not strange given the performance Germany had proven mighty of against Brazil. Close to the end of the extra time, Mario Götze would destroy the Argentine dreams. As the biggest star in the game at the time, Messi had enormous expectations to live up to in the 2018 World Cup. Already in the second game against Croatia, it stood clear that Argentina and Messi probably would deliver that many had expected. Argentina was beaten with three goals to none. Still, under hard pressure, Argentina had managed to take the second place in the group. But they were nevertheless eliminated by France – the soon-to-be champions – in a spectacular match. The Argentine side in 2017 before a World Cup Qualifying game. Argentina has participated 17 times in the World Cup. South American Championships were known until 1975 as the Campeonato Sudamericano before it was renamed to Copa América. Argentina has participated 45 times in the tournament. * In 1959, two South American Championship, in Argentina and in Ecuador. The logo of Argentina has the "AFA" (Asociación del Fútbol Argentino) initials in the center against gold colored background. Above that, three lines in light blue and white mark the Argentine flag. Around the inner part of the crest goes a band of stylized grains.